According to legend, the demon Asmodeus once transformed himself into King Solomon and ruled his people until the real King Solomon was able to retrieve his magical ring, the Seal of Solomon, and drive Asmodeus off. What is known only to Solomon and his followers, is that after he regained his ring and before he took back his throne, King Solomon descended into Hell pretending to be Asmodeus whom the demons knew was impersonating Solomon. With the help of his ring, Solomon captured nine great demons and brought them back to the day lit lands, where he bound them into scrolls. Solomon then founded his Circle, the Orbis Suleimani, to guard these demons and keep them bound. After a time, the bindings on the scrolls began to weaken. The Orbis Suleimani rebound them into great tomes. Each book could be used to invoke the demon bound within to do certain tasks. After the events of The Tempest, Prospero bound the demons anew yet again by planting the books. When the books sprouted and grew into trees, he cut a branch and made it into a staff. The demons were now bound into the staffs, each staff retaining the ability to invoke the power of the demon imprisoned within. The text here is taken from the 1904 text of the Goetia, a compendium of 72 demons first recorded as part of the the 17th century grimoire as The Lessor Key of Solomon, edited by S. L. MacGregor Mathers. The italics highlights the particular power of the demon that the staff invokes. Staff of Summoning: Purson is the Twentieth Spirit listed in the Goetia, a great King who governs 22 Legions. He appears as man with a lion’s face, a viper in his hand, & riding on a bear as trumpets sound around him. He can also take an aerial body. He knows hidden things, can discover treasure, & can tell of past, present & future events. He also knows of the creation of the world, as well as other secret & divine things. He bringeth forth good Familiars. The Staff of Devastation: Haures (Hauras, Havres, Flauros) is the Sixty-fourth Spirit listed in the Goetia, who governs 36 Legions. He appears as a leopard but will take human shape with fiery eyes upon command. He tells of past/present/future events, & must be invoked into a triangle to ensure he won’t tell lies. He also will tell of creation, divine things, & how the spirits fell. Haures will destroy & burn all enemies of the invoker. The Staff of Decay: Vepar (Vephar) is the Forty-second Spirit listed in the Goetia, who governs 29 Legions. He appears as a mermaid. He governs the waters, guides armed warships, and can cause stormy weather for sailors. Vepar also has the ability to cause death within 3 days through infecting wounds & sores with worms. The Staff of Persuasion: Paimon: Once of the Order of Dominations, Paimon is the Ninth Spirit listed in the Goetia, who is obedient to Lucifer, & a great King who rules over 200 Legions. He appears in human form with a crown on his head, & is accompanied by hosts of Spirits playing music. If offerings are made to him, two kings named Labal & Abalim will accompany him, along with others in the Order of Potentates in his Host and 25 legions. He teaches arts, sciences, & other secret things including the mysteries of the world & man. He can make anyone subject to the Magician. He also gives and confirms dignity and gives good familiars. The Staff of Silence: Gaap is the Thirty-third Spirit listed in the Goetia, who governs 66 Legions. Amaymon is his King. He appears in human form before four mighty kings when the Sun is in the southern signs. He makes men either ignorant, insensible, or knowledgeable in liberal sciences & philosophy. 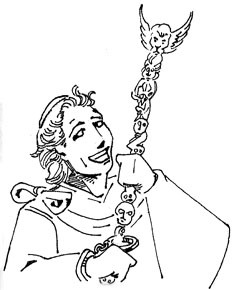 He can cause love or hatred, deliver familiars from other magicians, speak of past, present, & future events, & transport men from one kingdom to another. The Staff of Transportation: Bathin is the Eighteenth Spirit listed in the Goetia, who governs 30 Legions. He appears as a strong man with a serpent’s tail & sitting upon a pale colored horse. He knows of herbology & of precious stones, & has the ability to transport men from one country to another. The Staff of Wisdom: Vinae is the Forty-fifth Spirit listed in the Goetia, who governs 36 Legions. He appears as a lion or with a lion’s head, rides a black horse, & holds a viper. He discovers hidden things, witches & wizards, & events of the past, present, & future. He can also build towers, overthrow stone walls, & cause storms at sea. * At the commandement of the exorcist he answereth of things hidden, of witches, and of things present, past, and to come. * — it was Vinae’s ability to cause storms that led to the general belief that he was imprisoned inside the Staff of the Winds.